As Soybeans mature in the pod they ripen into a hard, dry bean. Soybeans have been the "meat" of the Orient for hundreds of years and are now being grown extensively in this country. 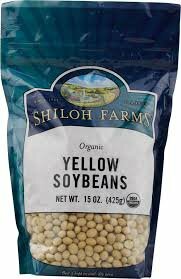 Soybeans are rich in minerals, B vitamins and unsaturated fats and they are high in lecithin. Because of their high concentration of nutrients and very mild flavor after cooking, soybeans may be made into or used in an amazing array of foods. Always sprout or cook soybeans before eating in order to destroy the urease and antitrypsin enzymes that interfere with digestion. The best way to improve their digestibility is to cook them very thoroughly - never skimp on time when cooking soybeans. In 1942 a group of like-minded people gathered on a farm in Western New York and founded the Shiloh Community. Their common goal was to live and work together in health and harmony. To help support themselves and sustain their lifestyle they created a bakery and became known for their hearty, healthy all-natural products. Organic certification had not yet been invented. This was the beginning of SHILOH FARMS. If you have any questions about this product by Shiloh Farms, contact us by completing and submitting the form below. If you are looking for a specif part number, please include it with your message.